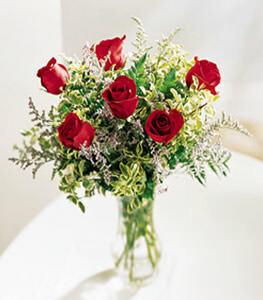 This popular vased bouquet features six red roses arranged with greens and accents. A beautiful way to send your love or best wishes on any occasion -- or for no special reason at all. Six red roses with limonium in a glass cylinder vase. I want to also thank you for the beautiful flower arrangement that you had sent to him. He was completely overwhelmed by the flower arrangement and after heart surgery really made his day. Job well done!